It turns out that all saturated fats are not equal. Each saturated fat has its own structure, and their individual differences influence the way they work in your body, reports an article in the January 2014 issue of the "Journal of the Academy of Nutrition and Dietetics." Several saturated fats, called medium-chain triglycerides, are metabolized more like carbohydrates than fats and quickly used for energy. Most fatty acids -- called long-chain fatty acids -- have 12 to 22 molecules of carbon. Medium-chain triglycerides, or MCTs, are saturated fats containing 8 to 12 carbons. Most fatty acids go through a special digestive process, which allows them to travel through your bloodstream to tissues that metabolize or store fats. MCTs are different because they're easily absorbed, then metabolized in the liver and used for energy. The three MCTs -- capric acid, caprylic acid and lauric acid -- are naturally found in a variety of animal and vegetable fats, but few sources contain significant amounts. 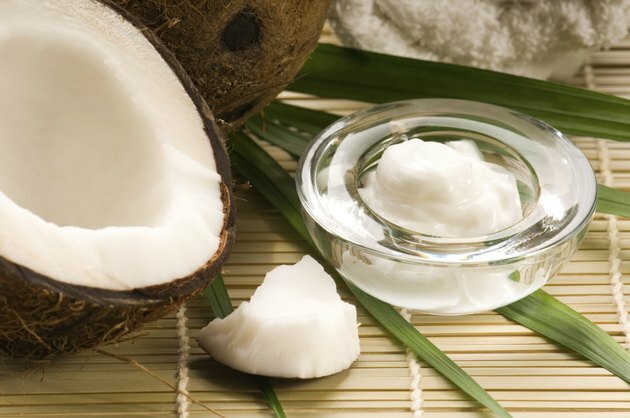 Coconut oil and palm kernel oil are the top sources of MCTs. Both have about 11 grams of saturated fat in 1 tablespoon of oil. Out of the total saturated fat, you'll get 7.4 grams of MCTs from a tablespoon of palm kernel oil and 7.9 grams from coconut oil. These oils are commonly used as cooking oils in snack foods, sweets, instant noodles, baked goods and nondairy creamers. The only way to know whether they're in the food you buy is to check the list of ingredients. Milk is a natural source of MCTs, but the amount you'll get depends on whether you buy whole or low-fat products. One cup of whole milk has 0.55 gram of MCTs, while skim milk contains barely a trace amount, according to the U.S. Department of Agriculture. One tablespoon of butter has 1 gram of MCTs, and one slice, or 1 ounce, of cheddar cheese provides 0.4 gram. Butter, whole milk and cheese all contain 5 to 7 grams of total saturated fat, so the amount of artery-clogging fats you'll consume exceeds the amount of MCTs. Commercially prepared foods often have more MCTs than their counterparts cooked at home. Unfortunately, the higher amount of MCTs also goes hand-in-hand with more total and saturated fats. For example, a generic fast-food biscuit with ham has 6 grams of MCTs and 16 grams of total saturated fats, according to the U.S. Department of Agriculture. By comparison, one large frozen biscuit baked at home and a 3-ounce serving of ham have barely a trace of MCTs and one-fourth the amount of saturated fat. How Many Calories Does a Costco Croissant Have? Does MCT Oil Make You Lose Weight?